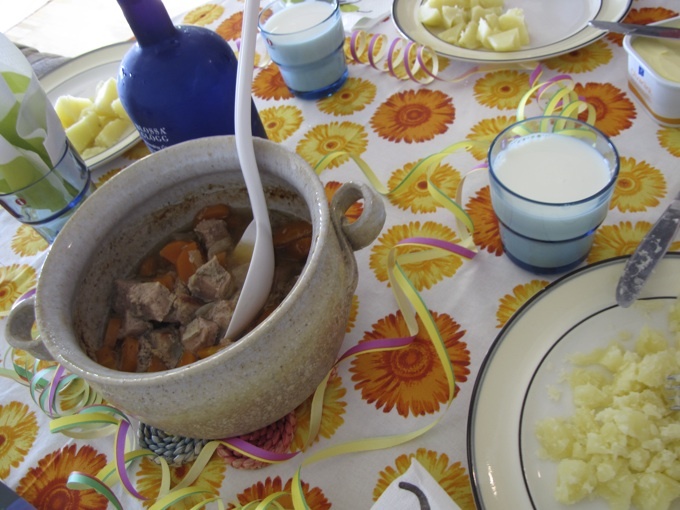 The Karelian hot pot (British) or Karelian stew (US) (karjalanpaisti in Finnish) is a traditional meat stew originating from the region of Karelia (now split between Finland and Russia). It is commonly prepared using a combination of pork and beef, but lamb can also be used. Along with the Karelian pasties (karjalanpiirakat), it is the most widely recognised Karelian food in Finland. In 2007, it was selected as the national dish of Finland by the readers of the Finnish newspaper Iltalehti. The hot pot is usually seasoned with black peppercorns and salt. Other seasonings such as allspice and bay leaf may be used too. Common vegetables such as carrot, onion, and root vegetables are acceptable additions to the stew. Like most other Karelian foods, the Karelian hot pot is traditionally cooked in a pot (uuniruukku or potti in Finnish) placed inside an oven. In Karelia, it is usually referred to as just 'oven stew' (uunipaisti). The term Karelian hot pot can be used to refer to nearly any food that contains meat and that is prepared in this traditional Karelian fashion. Due to the scarceness of meat in the past, the hot pot was traditionally only prepared for festive occasions. As meat became more readily available during the 20th century, the dish became a common, everyday food throughout Finland. Serves: four - five persons. Cut the meat into cubes (4x4 cm). There is no need to remove small bones. Put the meat and coarsely chopped onion in layers in a casserole, seasoning each layer with salt and allspice. Add enough water to almost cover the meat. Bake without a cover at a moderate temperature, c. 175 °C, for 2 1/2-3 hours. Cover the casserole towards the end of the cooking time. Serve with mashed potato, boiled swedes and lingonberry purée.